WORLD leaders and celebs have mourned the loss of the iconic Notre Dame Cathedral in Paris after a devastating fire. French President Emmanuel Macron defiantly declared “we will rebuild” after attending the scene of the catastrophic blaze which broke out at 5.30pm. He said he was “sad to see this part of us burn” as he responded to the fire, which destroyed the 850-year-old church’s spire and much of its roof. In French, Mr Macron wrote on Twitter: “Our Lady of Paris in flames. Emotion of a whole nation. Thought for all Catholics and for all French. French billionaire François-Henri Pinault, who is married to Hollywood actress Salma Hayek, has pledged €100million to help rebuild the cathedral. “My heart goes out to Paris,” she tweeted. “Notre Dame is a symbol of our ability as human beings to unite for a higher purpose – to build breathtaking spaces for worship that no one person could have built on their own. A fire service spokesman said the two towers and the main structure of the cathedral have been saved by 400 heroic firefighters from complete destruction. Emmanuel Gregoire, the deputy mayor of Paris, said the cathedral had suffered “colossal damages” and that emergency workers were trying to salvage the art and other priceless pieces stored inside. Scaffolding that had been set up around the building has been decimated along with large parts of the Cathedral itself, including the spire, which dates back to the mid-19th Century. French prosecutors have launched an investigation although arson has been ruled out as a “stray flame” linked to £5 million renovation work is thought to have sparked the inferno in the loft at around 5.30pm local time. INTERNET users spared no time mocking the Notre Dame’s blaze on its Wikipedia page after a devastating fire engulfed the iconic landmark this evening. Under the Architecture section of the page, the cathedral’s functional status was edited to say: “On fire and dying inside :)”. Internet trolls updated the Functional Status to this while the Notre Dame was up in flames The status of the iconic landmark was later updated to reflect that is unknown what the extent of the damage is A fire broke out at Notre Dame at 5.30pm local time and flames were still burning more than five hours later As the inferno raged on, the status was also updated to “On Fire”. [bc_video video_id=”6026448981001″ account_id=”5067014667001″ player_id=”default” embed=”in-page” padding_top=”56%” autoplay=”” min_width=”0px” max_width=”640px” width=”100%” height=”100%” caption=”Notre Dame fire – This is the moment the Spire collapses as blaze breaks out at the cathedral”] Its functional status has now been updated to say “Unknown (Fire damage)” after firefighters saved the main structure of the cathedral from complete destruction. Crews are still working to contain the flames – with the latest images showing the damage from inside the landmark. Flames are still burning on the roof as debris covers the first rows of pews inside the cathedral. Another image shows missing sections of the ceiling. Dramatic photos show the damage caused by the blaze that destroyed the 850-year-old’s church’s spire and much of its Gothic roof. The fire broke out at 5.30pm local time this evening and 400 firefighters were deployed to battle the inferno. France’s Deputy Interior Minister Laurent Nunez said “the fire had since decreased in intensity”. Emmanuel Gregoire, the deputy mayor of Paris, said the cathedral had suffered “colossal damages”. Police said there have been no deaths, but one firefighter has been “seriously injured”. [article-rail-section title=”MOST READ IN WORLD NEWS” posts_category=”15″ posts_number=”6″ query_type=”popular” /] French President Emmanuel Macron tweeted: “Notre Dame of Paris in flames. “Emotion of a whole nation. Thoughts go out to all Catholics and all of France. Like all our countrymen, I’m sad tonight to see this part of us burn.” He later said: “We will rebuild.” The cathedral’s functional status was also update to just say ‘On Fire’ This image shows the damage inside the cathedral as a fire can still be seen burning in the ceiling This photo shows the flames through damage in the Notre Dame’s ceiling Crews are battling to put out the flames, which had largely been contained by the time they went inside the church This aerial shot shows the scale of how much the fire had spread [bc_video video_id=”6026515077001″ account_id=”5067014667001″ player_id=”default” embed=”in-page” padding_top=”56%” autoplay=”” min_width=”0px” max_width=”640px” width=”100%” height=”100%” caption=”French President Emmanuel Macron address the fire that has partly destroyed Notre Dame Cathedral “] We pay for your stories! Do you have a story for The Sun Online news team? Email us at tips@the-sun.co.uk or call 0207 782 4368. You can WhatsApp us on 07810 791 502. We pay for videos too. Click here to upload yours. HERO firefighters saved Notre Dame from total destruction in a vital 30 minute battle with the blaze. They somehow prevented the iconic landmark from collapsing after staff at the cathedral took 23 MINUTES to even find the fire, it has emerged. Aerial footage reveals the extent of the damage to Notre Dame’s roof after the fire The blaze spread after it took staff 23 minutes to find the fire on the roof [bc_video video_id=”6027026532001″ account_id=”5067014667001″ player_id=”default” embed=”in-page” padding_top=”56%” autoplay=”” min_width=”0px” max_width=”640px” width=”100%” height=”100%” caption=”Notre Dame fire – Drone footage reveals extent of damage to the world-famous cathedral after devastating blaze “] Paris prosecutor Remy Heitz said that workers were unable to find the rampaging fire after an alarm sounded at 6.20pm on Monday. It was only when a second alert sounded at 6.43pm that the blaze was discovered on the Gothic roof. As the flames were finally extinguished after eight hours’ destruction, prosecutors in Paris began a criminal investigation into the cause of the raging inferno. Public prosecutor Heitz said the fire at the 850-year-old building was probably the result of an accident and there was no sign it was started deliberately. “We are favouring the theory of an accident,” he said, adding that 50 people were working on a “long” and “complex” probe. He said they would be interviewing workers from five companies that had been hired to work on renovations to the cathedral’s roof, which was where the fire is thought to have started. Drone footage shows the extent of the fire damage WHAT WE KNOW SO FAR: Huge blaze broke out at 850-year-old Notre Dame Cathedral on Monday afternoon The structure’s 300ft spire collapsed and Gothic roof turned to ash in the ferocious blaze 400 firefighters battled the inferno, managing to save the main structure and rescue Jesus’ Crown of Thorns Authorities have launched a criminal investigation into what caused the blaze President Emmanuel Macron said ‘We will rebuild’ as Paris mourned loss Millions have already donated towards restoration, including Salma Hayek’s French billionaire husband Francois-Henri Pinault This comes as French President Emmanuel Macron vowed to restore the famous church to its former glory within five years. Addressing the nation, he said: “We will rebuild Notre Dame even more beautifully and I want it to be completed in five years. We can do it. “It is up to us to change this disaster into an opportunity to come together, having deeply reflected on what we have been and what we have to be and become better than we are. It is up to us to find the thread of our national project.” But after the blaze was finally brought under control, many on Twitter turned their anger towards those responsible for the disaster. Heroic freighters saved the iconic cathedral from collapsing in a vital 30 minute battle with the blaze Fallen debris inside Notre Dame Cathedral after a devastating fire destroyed part of the landmark Staff only found the fire on the church’s roof after a second fire alarm sounded yesterday evening People gather at a vigil for the devastated cathedral in Paris Locals are coming to terms with the disaster which officials believe could cost upwards of €100bn Inspection of the damage began at first light A couple hug as they look at the damaged cathedral The fire started at around 7pm, local time It took French fire fighters eight hours to extinguish the blaze Firefighters look out from Notre Dame this morning Smoke can be seen rising from the burnt remains inside Notre Dame Mostar Bridge is illuminated with the colours of French flag following the massive fire he dome of the Chapel of the Shroud illuminated with the colors of the French flag in Turin, Italy The Empire State building in New York was also aglow in blue, white and red [bc_video video_id=”6026831963001″ account_id=”5067014667001″ player_id=”default” embed=”in-page” padding_top=”56%” autoplay=”” min_width=”0px” max_width=”640px” width=”100%” height=”100%” caption=”Notre Dame fire – French President Emmanuel Macron has vowed to rebuild the cathedral so it’s ‘even more beautiful’ during address to the nation “] “This is unacceptable, one of the most historic cathedrals in human history burning to the ground, a landmark, an icon,” wrote one user. “I can only hope that the immolation was natural because if it is found that the blaze was caused by some idiot it’ll be disgusting beyond belief.” Another added: “This is unacceptable. Whoever caused this deserves to rot.” Others though appeared to have some sympathy for those responsible. “In case it truly was an accident that caused the fire, we should pray for the person who made the mistake that started it all,” read one post. “Can you imagine being the guy who accidentally burned down Notre Dame and how horrific that would be? He’s going to need prayers. Lots of them.” The police probe is currently focused on Le Bras Freres (Le Bras Brothers), a company based in Jarny, in the Meurthe-et-Moselle department of north-eastern France. Some of its 200 specialist employees were working on the wooden and lead spire of Notre Dame Cathedral that collapsed on Monday evening after the fire broke out on the roof at 6.45pm. Julien Le Bras’ firm was working on renovating the spire The charred ruins of the inside of the cathedral were visible at day break The blaze was finally put out after eight hours Millions have been pledged for the restoration of the historic cathedral The damage to the cathedral can clearly be seen through a doorway “Many of these restorers were interviewed overnight,” said a source close to the investigation that has been opened into ‘accidental destruction by fire’. “The fear is that a small fire began in the rood where they were working, and quickly spread across the building. “The irony is that the restorers had just begun working on the spire which collapsed along with much of the roof.” Le Bras Freres is one of the most respected companies of its kind and last year finished a widespread restoration programme of Reims Cathedral in eastern France. It had won the contract to restore the Notre Dame spire that was designed by the architect Eugene Viollet-le-Duc and erected in 1859. It has emerged that Julien Le Bras, the boss of Le Bras Freres, boasted about his firm’s expertise in dealing with historic buildings. In a video posted online when the 32-year-old Le Bras said: “We are proud of our work on historic buildings. “We have the technical ability and the competence for his work. Our first thought is to protect the values of historical buildings, it’s in our DNA.” However, after the fire he said the company had 12 workers involved in the refurbishment and that none of them were on site at the time of the disaster. They were due to be on site for up to four years along with Europe Scaffolding, another company which had just put 250 tons of scaffolding around Notre Dame, along with a lift that could move up and down the 300ft spire. A man on his knees in prayer outside the cathedral People gathered outside the cathedral to see the damage for themselves Some on social media have called for anyone found responsible to face justice An aerial view of the charred remains of the roof Scaffolding has been in place for renovation work at Notre Dame Firefighters inspect one of the two towers, which survived the blaze On Tuesday morning Julien Le Bras, the chief executive of the Bras Brothers, said he had no initial comment on the enquiry. It will focus on the equipment being used by the restorers in a medieval cathedral where light and power sources were limited. In such circumstances, cables and wires have to be attached to dozens of generators, and hoisted high up on to the building. Paris prosecutors have opened a preliminary investigation, and have not yet ruled out any theories for the start of the fire, which blazed from 6.50pm on Monday until 3am on Tuesday. ONE FIRE FIGHTER INJURED Stories of the 400 firefighters’ heroism in saving the cathedral’s priceless relics have emerged. They include Jean-Marc Fournier, Chaplain of the Paris Firefighters, who risked his life to by running into the burning cathedral. Among the most precious is a relic venerated as the Crown of Thorns worn by Jesus Christ – considered Paris’s equivalent of the Crown Jewels – and its three stained-glass rose windows. An unidentified fire fighter was the only human casualty of the blaze, and he was today in hospital with “non life threatening injuries,” said a spokesman for the Paris emergency services. 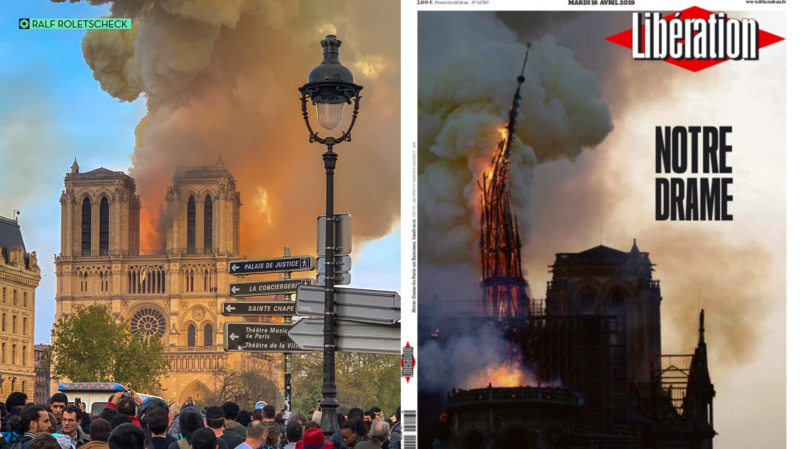 He confirmed that when the fire broke out, the cathedral’s alarms started and the visitors inside Notre Dame were quickly evacuated. Andre Finot, communication manager of the Cathedral said: “At the moment, we don’t know why the cathedral caught fire. “Normally, there should be no more workers on the site because they are supposed to stop between 5pm and 5:30pm at the latest. But we are not sure there was no one left on the site”. The investigation is focusing on the company carrying out restoration work The sight of the damaged cathedral appears to be too much for one man Others gathered by the River Seine to take a look The extent of the damage can be seen from the distance after the cathedral fire [bc_video video_id=”6026813433001″ account_id=”5067014667001″ player_id=”default” embed=”in-page” padding_top=”56%” autoplay=”” min_width=”0px” max_width=”640px” width=”100%” height=”100%” caption=”New close-up video shows how firefighters were faced with terrifying wall of flames as fire engulfed Notre Dame cathedral in Paris”] Mr Finot confirmed that a 100m crane had just been deployed to take 16 copper statues depicting Apostles and Evangelists off the roof, and all had been saved. Olivier De Chalus, the head of volunteer guides at the Cathedral, said: “The fire left the attic, and then spread extremely fast to a large part of the roof. “The flames devoured the wooden structure that we call the Forest because of the large number of beams that are all made from single trees.” It came as French billionaire Francois-Henri Pinault, who is married to Hollywood actress Salma Hayek, pledged €100 million (£86.2 million) towards the rebuilding of the Cathedral. MACRON VOWS TO REBUILD French President Emmanuel Macron has also vowed to rebuild Notre Dame with help from the international community. Mr Macron said a national fundraising campaign to restore the historic building would be launched on Tuesday, and he called on the world’s “greatest talents” to help. The French leader credited the “courage” and “great professionalism” of firefighters with saving Notre Dame’s spectacular Gothic facade and two landmark towers from being destroyed, saying “the worst has been avoided”. “We have been dealt a knockout blow,” a grief-stricken Paris Archbishop Michel Aupetit said at the scene. The blaze broke out just before 7pm local time in a roof area undergoing around £6m of renovations. More than 400 firefighters battled the flames, which quickly spread along the roof, causing burning timbers to collapse onto the ceiling of the vault below. At around 3am local time, Paris fire brigade chief Jean-Claude Gallet said: “We can consider that the main structure of Notre-Dame has been saved and preserved as well as the two towers.” And a brigade spokesman added: “We will continue to watch over any residual pockets of fire and cool down the areas that are still red-hot, like the wooden beam framework.” ‘KNOCKOUT BLOW’ Paris mayor Anne Hidalgo said: “Thank you to the Paris fire brigade, policemen and the municipal agents who have made this evening a tremendous human chain to save the works of Notre Dame. “The Crown of Thorns, the tunic of Saint Louis and several other major works are now in a safe place.” Priceless works that couldn’t be moved fared less well. Firefighters told how the building’s stained-glass rose windows, high on the north, west and south faces of the cathedral, “exploded” in the heat of the inferno. “They exploded because of the heat of the blaze,” said one, referring to the Rosette West, which was created in 1225, the Rosette North and the Rossette South, both from 1250. The Vatican expressed its “incredulity” and “sadness” over the fire and offered prayers for firefighters tackling the blaze and solidarity with the French people. In Washington, Donald Trump tweeted: “So horrible to watch the massive fire at Notre Dame Cathedral in Paris.” The Archbishop of Canterbury Justin Welby sent the best wishes of the Anglican church to people at the scene. “Tonight we pray for the firefighters tackling the tragic Notre Dame fire – and for everyone in France and beyond who watches and weeps for this beautiful, sacred place where millions have met with Jesus Christ,” he said. The Queen sent a message to President Macron that said: “Prince Philip and I have been deeply saddened to see the images of the fire which has engulfed Notre Dame Cathedral. “I extend my sincere admiration to the emergency services who have risked their lives to try to save this important national monument. [article-rail-section title=”MOST READ IN WORLD NEWS” posts_category=”15″ posts_number=”6″ query_type=”popular” /] “My thoughts and prayers are with those who worship at the Cathedral and all of France at this difficult time.” The message was signed: “Elizabeth R.” And British Prime Minister Theresa May added: “My thoughts are with the people of France tonight and with the emergency services who are fighting the terrible blaze.” The open door of the cathedral reveals the damage inside Some of the relics that have been rescued from the cathedral Firefighters risked their lives to save the artefacts from the blaze Patrick Palem, expert of the heritage restoration, stands near the statues which sat around the spire of the Notre-Dame Mr Belem inspects the head of a statue that sat around the spire of the cathedral Emmanuel Macron, centre, and his wife Brigitte visited the cathedral last night The 300ft spire collapsed in the blaze but the two towers survived Fire fighters were still at the scene this morning Fire fighters inspect the damage to the cathedral Fire fighters have confirmed the fire at Notre Dame is now out The cathedral’s spire was destroyed in the fire Notre Dame’s spire: before and after Luckily many priceless artefacts were saved A firefighter takes a well-deserved break after a hard night’s work [bc_video video_id=”6026448981001″ account_id=”5067014667001″ player_id=”default” embed=”in-page” padding_top=”56%” autoplay=”” min_width=”0px” max_width=”640px” width=”100%” height=”100%” caption=”Notre Dame fire – This is the moment the Spire collapses as blaze breaks out at the cathedral”] We pay for your stories! Do you have a story for The Sun Online news team? Email us at tips@the-sun.co.uk or call 0207 782 4368. You can WhatsApp us on 07810 791 502. We pay for videos too. Click here to upload yours. The stunning images show flames and smoke inside the cathedral’s iconic architecture. In international news today, a massive fire broke out at the Notre Dame Paris cathedral cause the Notre Dame spire collapse and much more damage. Photos from inside Notre Dame Cathedral have been released after a massive blaze tore through the treasured Parisian landmark Monday. The flames began just before 7 p.m. local time Monday and spread rapidly throughout the cathedral, which is one of Europe’s most well-known structures.